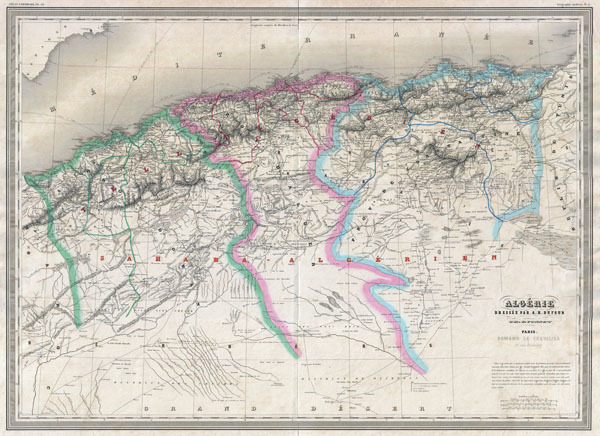 An extremely attractive and monumentally proportioned 1857 map of Algeria by the French cartographer A. H. Dufour. Algeria is depicted divided into the administrative districts of Oran, Alger and Constantine. Shows roads, rivers, caravan routes, cities, and topographical features. Also details several nautical routes between different Algerian cities and Europe. Prepared by Dyonnet as plate no. 37 in A. H. Dufour's 1857 issued of the impressive elephant folio Atlas Universel.